Scientists recently detected two newborn planets orbiting extremely close to their young, host stars. These baby planets, they say, are some of the youngest ever discovered. One of the planets, a Neptune-sized planet orbiting a star about 470 light years away, is just 11 million years old. The other, a Jupiter-sized planet orbiting a star about 430 light years away, is barely two million years old. In human years that might sound pretty ancient, but on the scale of the universe, these stars may as well have been born a few months ago (for reference, our own star is 4.5 billion years old). Nature, while the other was published in the Astronomical Journal. The planets aren’t just special because of their ages. They’re both giant planets, and they both orbit extremely close to their host stars — so close that it only takes them about five days to complete a full orbit. An enduring puzzle about exoplanets, Phys.org writes, is why they are often much closer to their stars than the planets in our own solar system. 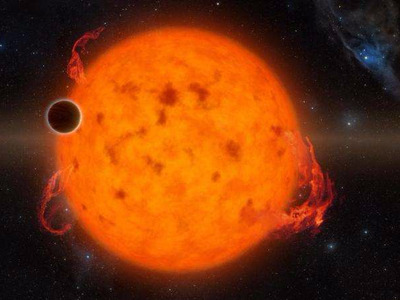 Finding such large planets located so close to their stars will be a huge step in solving this. So far, scientists have come up with two possible scenarios to explain this phenomenon: In the first scenario, these planets were born and raised in the hot inner disk close to their star. The second scenario suggests that interactions with other stars and planets might have actually caused the planet to migrate from cooler regions further away from the star. Scientists can test these scenarios by locating infant planets and looking at their orbits. Andrew Mann, lead author of the paper about the Neptune-sized planet, thinks that how and when these planets achieve these tiny orbits might actually affect may how terrestrial planets form. “If Jupiter or Neptune had migrated inward after the terrestrial planets formed, it seems unlikely that our Solar System would have an Earth, or any of the terrestrial planets at all,” he told Phys.org. By studying these giant cosmic babies, we might get a better grasp on our own planet. “Understanding how planets form is important if we’re to understand the formation of the Earth, and ultimately, how we got here,” said Erik Petigura, co-author of the paper about the Neptune-sized planet, to the Guardian.